Most of us want to take the house comfort outdoors whenever we go camping in RV. We want to catch up with a big game over the weekend, follow our favorite TV shows or simply watch the news on TV. For that to happen, you need an RV TV antenna. On our part, we’ve always relied on the Winegard GM-6000 Carryout G2+ because of its versatile installation. Now that you also want one of these devices in your RV, the choices on the market can be confusing. Today we are going to explore and uncover the possibilities at your disposal and get you ready to pick the best RV TV antenna that suits your needs. The Winegard SK-SWM3 DIRECTV TRAV'LER RV Satellite System claims to be the only RV TV antenna that is compatible with DIRECTV HD programming. Made with approved and certified reflectors, this antenna guarantees the strongest signal strength. This ensures that you enjoy watching your favorite shows in high definition only from satellites 99, 101 and 103. Furthermore, it is compatible with most DIRECTV receivers such as the popular Genie and others listed in the manual. With this RV antenna, you can watch a range of channels simultaneously due to its multi-satellite viewing capability. This applies to when there are multiple TVs in the RV so anyone can switch to their favorite choices. In addition, the Winegard SK-SWM3 DIRECTV TRAV’LER is great with DVR, meaning you can record movies beforehand and watch them later. We like the ease of operation of this RV antenna via the on/off button, while it packs down to less than 10 inches. The full package includes TRAV’LER SK-SWM3 satellite antenna, SWM power inserter, and 4-way splitter plus printed instructions. It is made for roof mounting only and Winegard recommends that the mounting should be done by a professional. Well, unless you’ve done this before then you can do it on your own. Intended for stationary use only, the device measures 44’’ x 34’’ (L x W) and weighs 53 lbs. The specified travel height is 9.75’’ and that’s probably why a professional installer is needed to get the figures right. Worth mentioning is that this RV TV antenna comes with a 2-year warranty on parts along with a 1-year warranty on labor. This is to say that Winegard stands behind their products and are there to support you when necessary. Overall, we love this RV satellite system for the freedom of watching programs that it brings in the RV combined with its ability to use with DVR. The price is a bit on the higher side, however, you will get real value for your money. The Winegard GM-6000 Carryout G2+ Automatic Portable Satellite TV Antenna is the most versatile unit we’ve seen to date. It’s compatible with the famous satellite providers in the industry including DIRECTV, DISH, and BellTV. DIRECTV offers Standard viewing while DISH and BellTV provide both Standard and HD editions. The user manual contains the list of receivers compatible with the device, which among them are DIRECTV H24 and HR24 receivers. 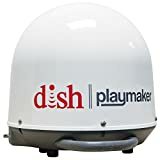 Unfortunately, the GM-6000 Carryout G2+ is not compatible with DISH Genie or Hopper receivers, however, you will find other DISH receivers in the manual. There are also a number of satellites that work with antenna, including 101 and 119 for DIRECTV, 110, 119 AND 129 for the DISH and satellites 82 and 91 for BellTV. This gives you unbeatable flexibility by the fact that you can easily switch between providers. An included power inserter makes it possible to do this from inside your RV without the need for a power cable. You will love the ease of setting up this unit plus its fully automatic operation. As a matter of fact, this unit can be installed in various locations on your vehicle, however, you have to buy the separately-sold optional mounts including roof mount, tripod mount, side or window mount, ladder mount, or rear cab mount. Another thing we like about this unit is its superior construction. 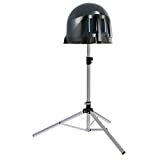 The reflector is made of sturdy aluminum for improved signal reliability as well as enhanced performance in harsh weather conditions, while the body features a strong and durable brass material. The base has been glass infused to protect against shock and vibration that might tamper with the accuracy of receivable signals. In addition, the antenna features Winegard’s patent-pending ring fed design which promotes signal strength. It is also enabled to recall previous locations in order to enhance faster signal acquisition, while an ultra-robust stepper motor encourages faster channel surfing. Other handy features include an incorporated Turbo satellite tuner along with USB-based field upgrade port, which helps reduce the chances of obsolescence that may result from satellite changes. In conclusion, the Winegard GM-6000 Carryout G2+ Automatic Portable Satellite TV Antenna is a sophisticated model that’s equipped with a range of useful features. The selling point is its versatile satellite programming, leave alone installation. You are likely to incur some additional costs for the mounting devices but it’s only a fraction of the cost. In any case, this is quite an affordable RV antenna. The KING VQ4100 Quest Portable/Roof Mountable Satellite TV Antenna is one of the most popular models among RVers. Designed to use with DIRECTV, the unit benefits from 100% automatic satellite acquisition which means that it locates DIRECTV satellite signals within moments of powering it on. It supports multiple TV viewing through a double output for two receivers. The compatible DIRECTV receivers include D10, D11, D12, H20, H21, HR20, HR21, HR22, HR23, H24 and HR24. DIRECTV KA-band satellites and SWM only receivers are not compatible with the KING Quest RV antenna. In as much as the KING Quest is primarily designed to work with DIRECTV SD programming, it allows you to add a controller accessory in order to make it compatible with DISH HD or BELL TV services. This is a major plus for non-DIRECTV subscribers despite the fact that the controller accessory must be bought separately. What we like about this unit is its portable operation. You can place it on the ground, choose to mount it on the roof of your RV (with no extra brackets required), or mount to the cab of a truck using a KING MB150 bracket (sold separately). Supplied with this device is a 50’ coax cable that allows you to connect the KING Quest antenna to your DIRECTV receiver via a small-inline injector. Keep in mind that you will need a portable generator, power pack, power inverter or any other 100V AC power source for the receiver, power injector, and your TV. All things considered, the KING VQ4100 Quest Portable/Roof Mountable Satellite TV Antenna brings portability and adaptability to your RVing experience. It’s one of the cheapest models on the market and the price justifies the features considering it doesn’t offer HD viewing. Portable antennas offer the greatest flexibility of all the RV antennas. You are able to move around a portable antenna in order to avoid the line of sight obstacles. In fact, you can switch a portable antenna from RV to RV and use it on a range of outdoor activities other than RVing. They are also cheap and are usually the first pick for the same reason. Many RVers like the domes because they are automatic and allow both still viewing and in-motion viewing. However, this depends on the model. They are sleek in appearance and tend to complement the RV. In addition, domes never take up any storage space like the portable antennas. These provide superior performance compared to the other two types. Often operated by a single on/off button, they are able to rise, rotate and skew to lock on all satellites concurrently, thus eliminating the need to toggle between satellites. The result is a chance for everyone to watch their favorite channels in the RV simultaneously. Another benefit of Automatic multi-satellite antennas is their compatibility with DVR’s. You can pre-record your kids’ favorite shows and keep them entertained while traveling down the road. The basic categorization of RV antennas falls under indoor or outdoor use. An outdoor antenna is attached to the roof of the RV and can be raised or lowered as needed. The biggest advantage of an outdoor antenna is its ability to pick up a ton of channels due to its location. On the downside, it is vulnerable to knocks and possible damage especially when driving under trees. Therefore, outdoor antennas must be lowered before driving down the road. On the other hand, an indoor antenna relieves your worries of collision with outside obstacles. It’s additionally easier to position and control and does not need to be stored when not in use. For you to pick the right antenna, it’s important that you know the factors to consider in choosing the best RV TV antenna from the plethora of devices in the market. After buying an antenna, the next step is installing it. Antennas come in various variations which result in a difference during installation. Make sure the RV antenna you buy won’t cause you any trouble when installing it. The best sources for this kind of information are previous user reviews; previous customers can always say if they had difficulty working with the product. If an antenna gives a hard time setting up, chances are it will end sitting in a box in the garage rather than enabling fun times outdoors. UHF signals dominate the airwaves these days and your antenna must be good at receiving them in order to get the most channels. A model that gets HD signals will be a plus in terms of picture quality. Simply because your RV TV antenna can receive a wide range of signals doesn’t mean it’s guaranteed to do so. The range matters too; some models have a superior range of receiving signals than others. Ensure you know the approximate range of any RV antenna that you consider to purchase before you give away the money. For instance, you will need a longer range RV antenna if you tend to camp in remote places. Of course, you want to enjoy satellite TV service while outdoors. You will have to decide whether to pick a DISH or Direct TV receiver. Both receivers are compatible with DVR and provide HD signals so, in the long run, this might come down to personal preference. On the other hand, having full access to TV might take away much of your camping experience and that it may incur you some subscription cost. In any case, most campsites offer cable television service to their guests so you may consider if you really want satellite TV. Size is not a top priority when it comes to buying an RV antenna but it cannot be overlooked. A large RV outdoor antenna could be stressful when driving under trees. A small indoor antenna can save up on space compared to a bigger option. You can mount the antenna in various locations such as the RV’s roof, trunk, bumper, hood channel and mirror bars. Every spot has its own pros and cons so you have to weigh them and decide which one suits your needs. Make sure you mount the antenna higher on the RV in order for it perform better plus the coil should be above the roof line. RV TV antennas are either made of plastic or aluminum. Whichever way, they can break right away if left open to the obstacles. If you are too concerned with range, get an indoor RV antenna that does not need to be raised or lowered down. This is determined by the material used in manufacturing an RV antenna. Some models are weak and easily snapped by a slight collision with an obstacle. These cannot be the best choice for your vehicle, especially if you go for an outdoor antenna. Some RV antennas are mounted in a fixed location on the roof while others can be drawn back into a lower position for traveling. A retractable antenna is the most preferred choice considering that an RV is already so high and there’s little clearance when going below trees or under bridges. The quality of the antenna that you want to buy must justify the price. Some retailers tend to hike the price of antennas so it’s upon you to establish whether an RV antenna is worth its price. The right RV TV antenna will go a long way to ensure that you stay tuned to your favorite TV shows and remain connected to the external world, even though you might use your RV to escape from the city life. 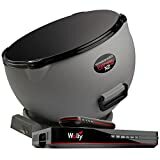 Having compared the three RV TV antennas above, we concluded that the Winegard GM-6000 Carryout G2+ Automatic Portable Satellite TV Antenna is the best overall model. Whether you are a DIRECTV, DISH or BellTV subscriber, you will find it quite handy. Other unique benefits include easy installation in various locations, exceptional signal reception, durable construction, and ability to switch providers. It definitely scores high marks in major areas compared to the other two units. All in all, this product will suit almost everyone’s needs including their budget. ​In closing, buying an RV antenna is not the toughest decision to make but whenever in doubt, come back to the guide above. That’s it and we hope you can now shop confidently for an RV TV antenna.